Your friends will really love getting these as gifts. Make them any size you like. 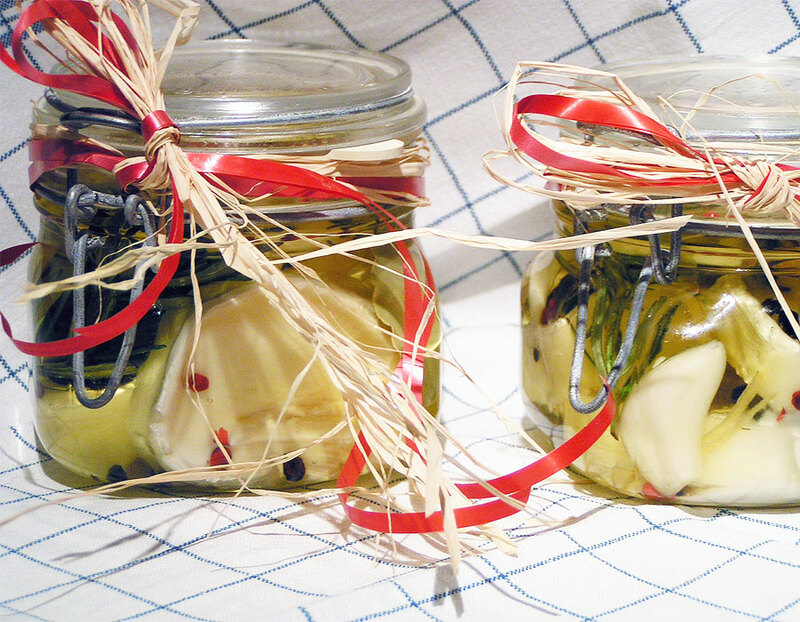 Give these as gifts around the holidays this is the amount you will need for 4 – 1/2 liter (or 1/2 quart) jars. You can make as many of these as you like. For Christmas I made 8 of them as gifts. After I bought the jars it only took a 1/2 hour to assemble everything. You can use this recipe to marinate your cherve to serve at dinner in a salad, grilled on toast served as Brochette or part of an Antipasti. From the day you make these in a closed jar they will keep in the refrigerator for 3 weeks and are ready to use after 1 week. To make this as an appetizer or a cheese course they will keep for about 2 weeks in a tightly covered container. Be sure to sterilize the jars to get the longest life from the this preparation. I think you will find this a versatile recipe, once the Cherve is marinated it can be use in variety of ways. In a salad, grilled on toast served as Brochette or part of an Antipasti. 4 1/2 liter (or 1/2 quart) mason jars or preserving jars. Servings: 1/2 liter (or 1/2 quart) mason jars or preserving jars. Preheat the oven to 100 degrees. Place all the jars in a large roasting pan. Put all the rubber seals or jar caps in as well. Once hot place the pan in the oven for at least 10 minutes to sterilize. Take the lemon and cut 8 strips of the rind. Separate all the ingredients into 4 small bowls except for the salt. Then take the cherve, remove the rind from each end and slice into 1cm (1/2 inch) slices. Divide all the slices into 4 equal piles. Start by layering each of the ingredients into the jars. Twist the lemon rind to help it release its oil. Now add the salt, 1 tablespoon of the white vinegar and top with the olive oil being sure to cover all the ingredients. Please read my notes below! Gently turn the jars upside down a couple of times to dissolve the salt and mix everything well. From the day you make these they will keep for 3 weeks refrigerated and are ready to use after 1 week. It is always a good idea to put a small label on/or under the jars with the final date that they should be used. 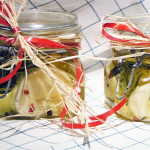 You can also reuse old jelly or pickle jars so long as the caps can be placed in the oven which normally they can these days. Cheapest Mason Jars???? IKEA 10kr each. Don't throw away the flavored oil you can use it as you eat the cheese for sauteing or salad dressings.